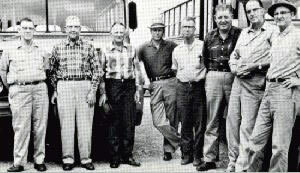 Description: James Maxey, Vernon Turnbull, Clifton Crowe, Archie Peck, Rayford Dawson, Shannon Thomas, Ed Huff, Buck Thornton. These men drove buses for many years. They had a lot of camaraderie. They took their job and discipline very seriously. The Bus Drivers worked closely with faculty and administration to help things run smoothly. Many a student has many memories of these men.